Recently, I went into my home office and just started organizing. It’s something that I have needed to do for such a long time and I just kept putting it off. I really can’t stand an unorganized desk but once you start piling things up, they just seem to take over. So, I spend a few hours organizing and cleaning and am happy to say that my office is now one of my favorite rooms in the house. Little did I know then that there are so many wonderful DIY organizers that would have made my job so much easier. 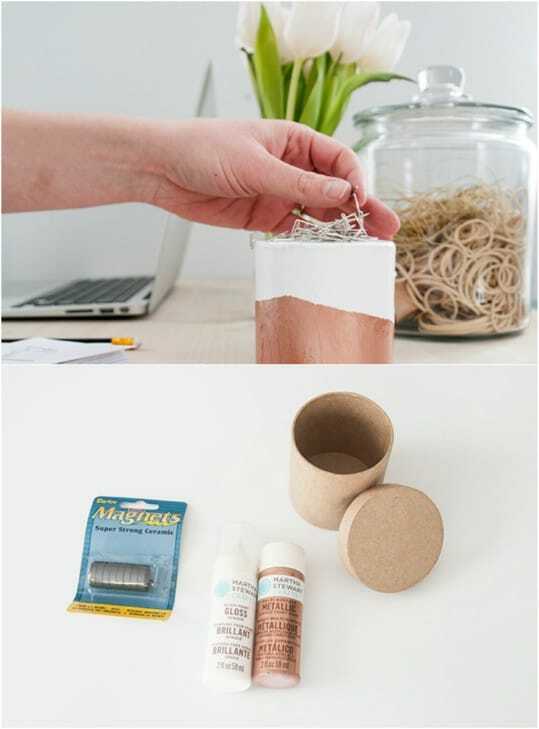 I wanted to share these 21 DIY desk organizers with you to maybe help you when you are organizing your office. Whether you have an office space at work or you work from a home office, organization is key to getting anything done. And, these DIY organizers are perfect for helping you to keep things in their place. These are all super simple DIY projects and many of them use upcycled or repurposed materials, which means that they are also super cheap. I do love a good DIY organizer, like these 50 genius command center ideas that will really help you to get your home organized. I have to stay organized. Without organization, my life would literally fall apart. There are always so many appointments, sports activities, dinners and other things to keep track of. If I get the least bit organized the entire system nearly shuts down! If you are the same way, these 21 DIY desk organizers are going to help you to keep track of everything and ensure that everything stays in its place. And, if you need help keeping your lifestyle organized, take a look at these 25 DIY calendars and planners for a more organized life. 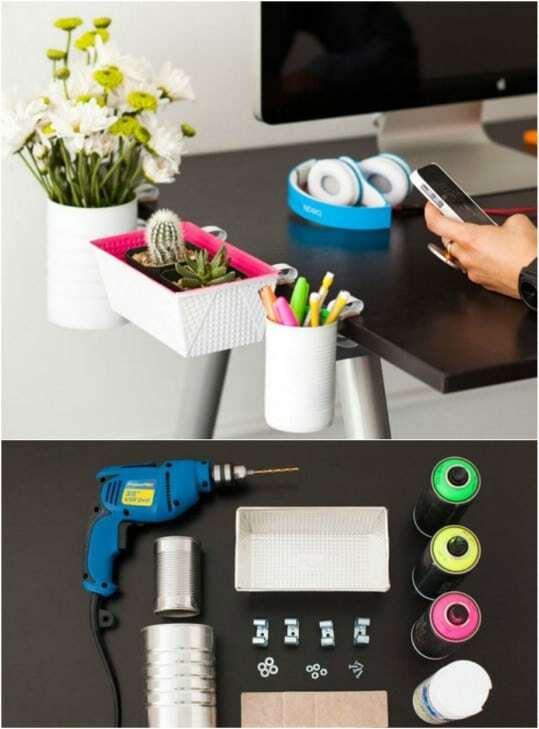 These little desk organizers would be so simple to make yourself. 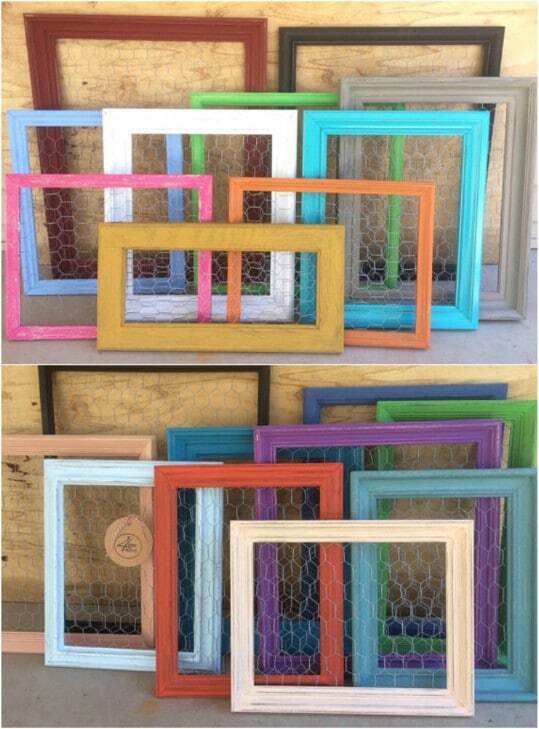 You just add chicken wire to some wooden frames and that’s about it. These are great for helping to keep your desk organized. You can use them to pin so many things and you could even clip smaller containers to them for holding pushpins, paper clips and so many other small office supplies. These are on Etsy and you get five for $150, or you could make them yourself from hardware supplies. These little DIY color block accessories are perfect for any number of desk supplies like your pushpins and paper clips. You make these from DIY paper mache circular contains so they are super cheap and then you just paint and add your magnetic feature so that those tiny office supplies will stay in place. So this may not seem like a desk organization project, but it is. 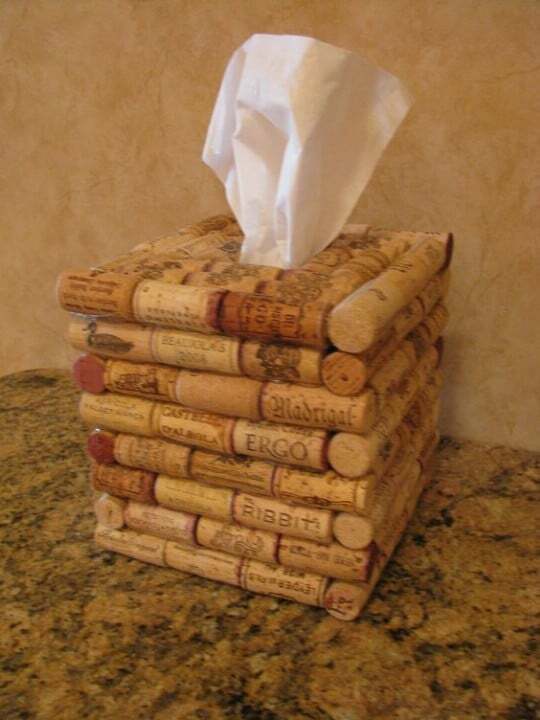 This DIY repurposed wine cork tissue box cover doubles as a neat little cover for your tissues and a place to hold your notes. You can stick notes to this with a pushpin since it’s made of cork and it helps to keep those post-it type notes off of your desk and computer screen. Plus, this is a super easy tissue box cover to make and it does have a certain appeal, don’t you think? You can get this neat desk organizer from Anthropologie for around $50. Or, you can DIY it and make it for around $3. It’s a no brainer, really. This one is made from all sorts of thrift store finds like vases and tins that you just paint over and attach to a board. You may already have everything on hand at home that you need to make this one, which would make it free! That’s much better than $50, don’t you think? Anthropologie knockoffs are some of my favorite DIY projects! 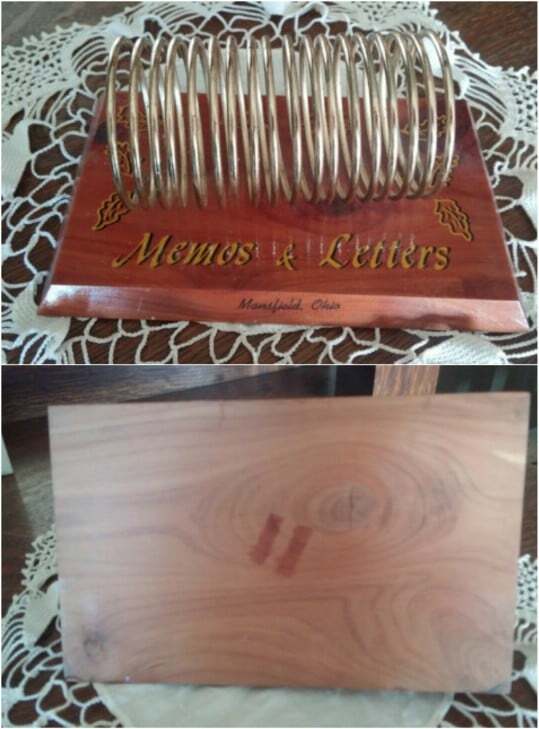 A small board and an old bed spring give you the means of making this wonderful desk organization letter holder. You just use glue or screws to attach the spring to the wood and then you can decorate the wood however you want to make it match your office décor. Or, you could simply take a look at this one that I found on Etsy. It’s just $12 and it’s made from a vintage spring from the 1950’s. Clean up the magazines and manuals on your desk with these DIY decorated magazine holders. You make these from a standard wooden magazine holder and some scrapbook paper. 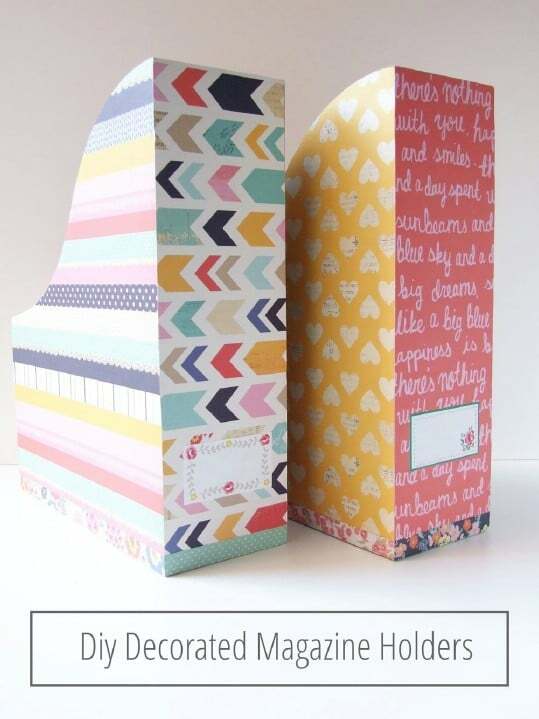 If you really want to save money and do a little upcycling while you are at it, you could also just cut out your magazine holders from upcycled cereal boxes and then cover them in the same way with scrapbook paper. These little DIY clip on organizers are perfect if you don’t really have a lot of space in your office. These clip right onto the side of your desk and can hold anything from pencils and pens to paper clips, rubber bands, metal binder clips or anything else that fits. You could even add a small plant or two to spruce up your office space. Just make the clip on organizers as big or as small as you need them. 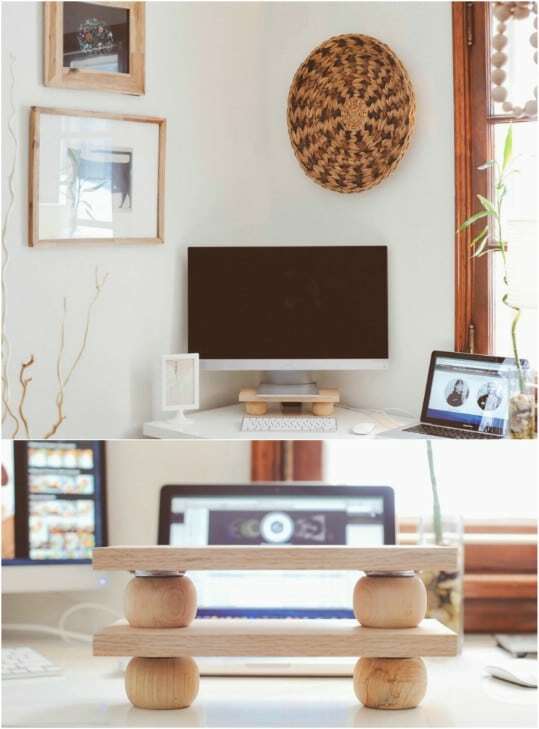 I love this modern monitor stand that you can DIY from a few pieces of wood. It gets your monitor up off the desk which makes it easier to see and gives you a bit more room on the desk. This one is so easy to make and won’t take you long at all to do. You need a few supplies for this one like an oak board, small wooden bun feet and top plates to put it all together. 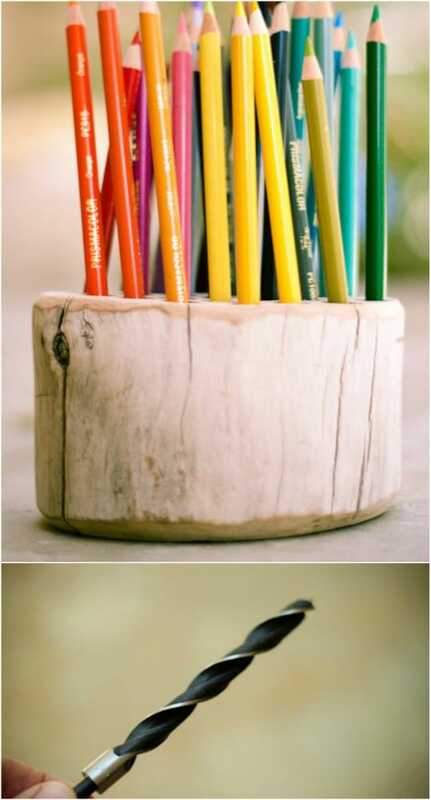 This little upcycled branch pencil holder would be perfect for keeping your colored pencils organized. You make this with a piece of wood that you can probably find in your yard, which makes it a free project. You just need a drill to make the holes and then maybe a clear coat to keep it shiny and protected. There are so many great, not to mention cheap, DIY projects using sticks and twigs! You can use these cute little magnetic clothespins to keep important papers organized or to hold your notes to keep your schedule organized. 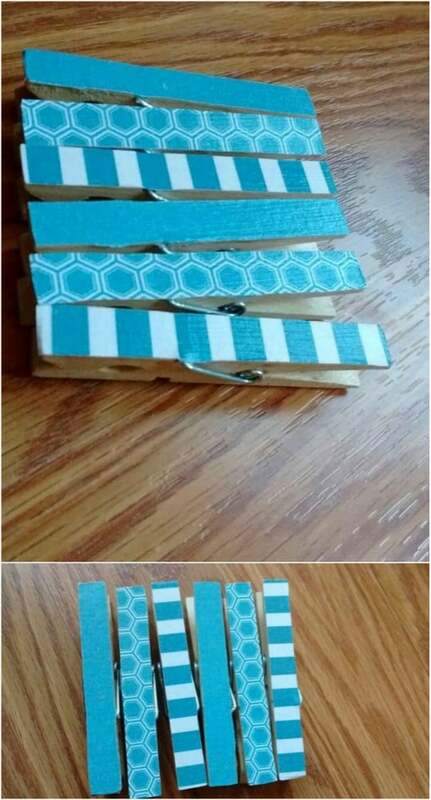 They are super easy to make with just a few cheap wooden clothespins, some washi tape or paint and some small magnets. You just have to glue on the magnets once you have your clothespins decorated. I found a really cute set on Etsy and it’s just $5 for six, and they’re already decorated for you. You can head out to your local office supply store and pick up a paper sorter but it’s probably not going to be made of wood. Wooden ones are so much sturdier and you can make your own for less than it would cost you to buy a cheap plastic one. 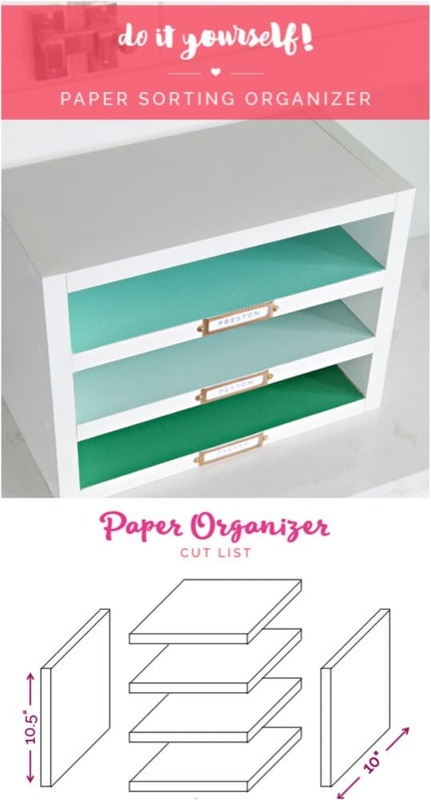 This DIY paper sorter and organizer is so easy to make and since you’re DIYing it, you can decorate it however you want. 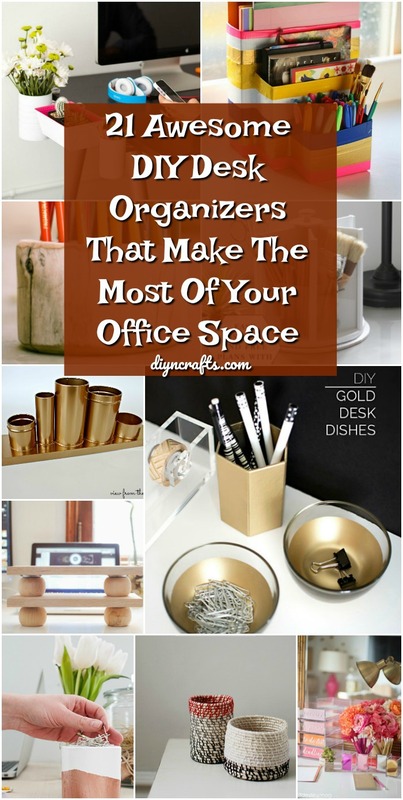 You can actually do these DIY golden desk dishes in any color that you need to match your office décor. They are super easy to make and give your desk such a decorative look. Use them to keep smaller items like rubber bands, paper clips and those binder clips organized and right there where you can always find them. 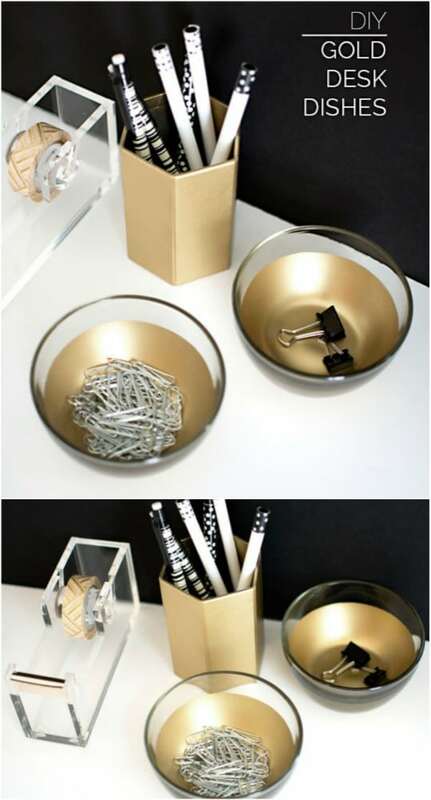 You can even use this method to turn your other desk organizers into decorative pieces. 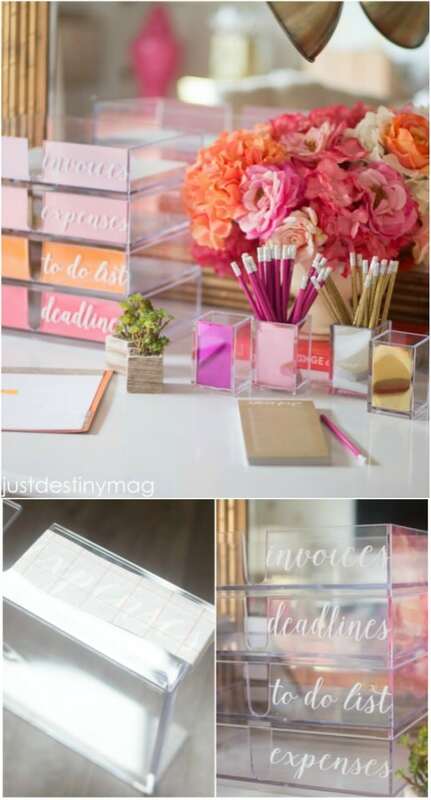 Add these lovely acrylic desk accessories to your office and you will always be organized. These are inspired by similar items from Kate Spade, but they are much less expensive to make than they are to buy. Similar items from Kate Spade will cost you about $35 for just one piece. You can make an entire set of accessories for much less than that and have enough organizers to keep your entire desk clutter free. Have you ever had a lazy Susan? I love these things in the kitchen and I love them even more in the office. They are so great for keeping things put neatly away and keeping them within reach at the same time. This DIY office lazy Susan has a space for all of your pens, pencils, paper clips and anything else that you want to put in it and they stay neatly in place thanks to the acrylic walls. 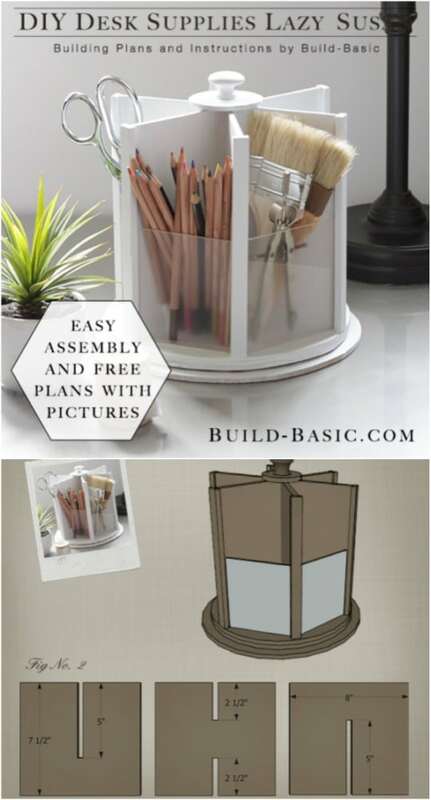 This one is inspired by Pottery Barn, although you will spend around $50 for theirs and you can build this one yourself for less than $20. The worst thing about my desk is that it is cluttered with papers. I need so many of these papers to be within reach and so I just leave them stacked up in a corner. 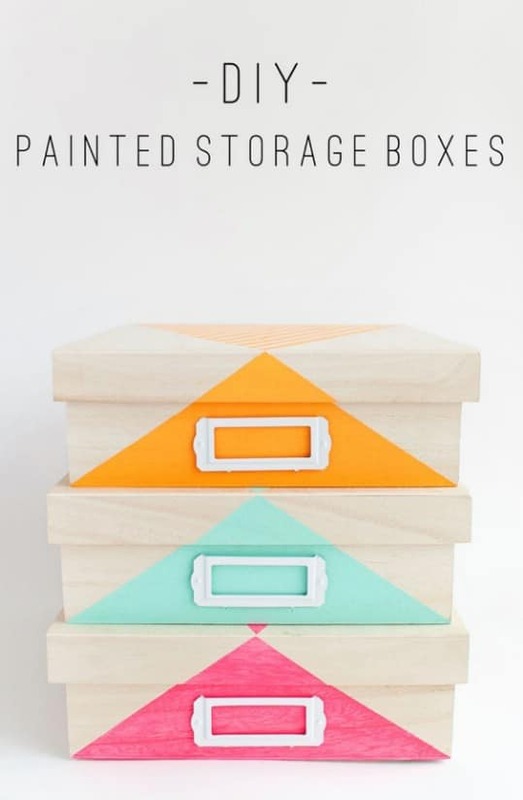 This DIY painted storage box idea would certainly solve that issue. You can paint plain wooden boxes to give them a great decorative look and then use them to organize and sort those important papers. You could even paint labels on them so you know which box holds which papers. 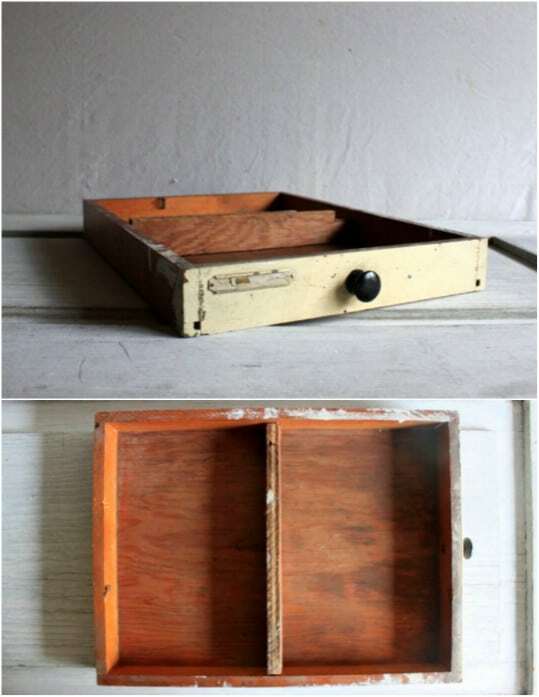 I love repurposing projects…like this old drawer that is turned into a desk organizer. This has such a nice vintage look and it’s a super easy one to make. You just take an old drawer and maybe repaint or stain it and add some contact or scrapbook paper to the inside. See? Super easy! Or, if you want something even easier, just check out this repurposed drawer desk organizer that I found on Etsy. You can get this one for around $15. This is a good one to add to your list of repurposing ideas for old drawers. Do you repurpose your food containers? Did you know that there are tons of repurposing ideas for empty cereal boxes? There are! And this repurposed box desk organizer is just one of them; although this is a really great one. You can make this as big or as small as you want. You just need an empty cereal box for each section that you want to make – or you could use any cardboard box that you may have on hand for this one. If you have never created coiled rope items, you are in for a great surprise. These are so simple to make and they look so gorgeous when they are finished. 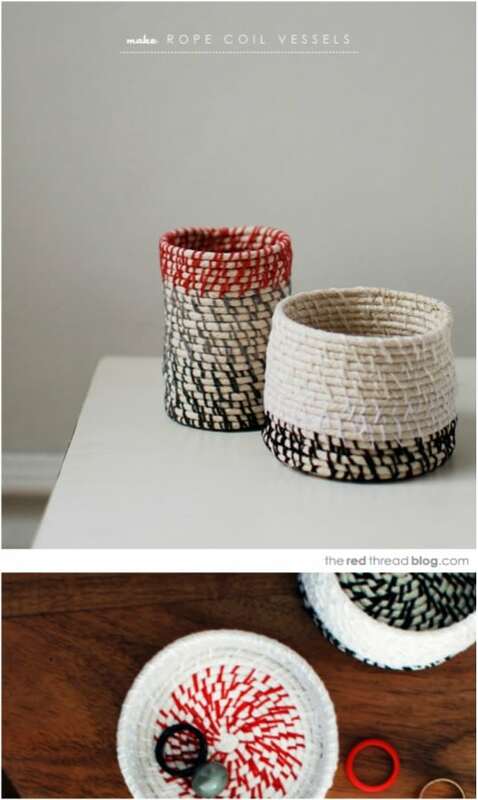 These DIY coiled rope desk accessories are great for pencil and pen holders and any number of other things. You can make them any size that you need. I love DIY rope décor projects – they’re so coastal looking and so versatile! 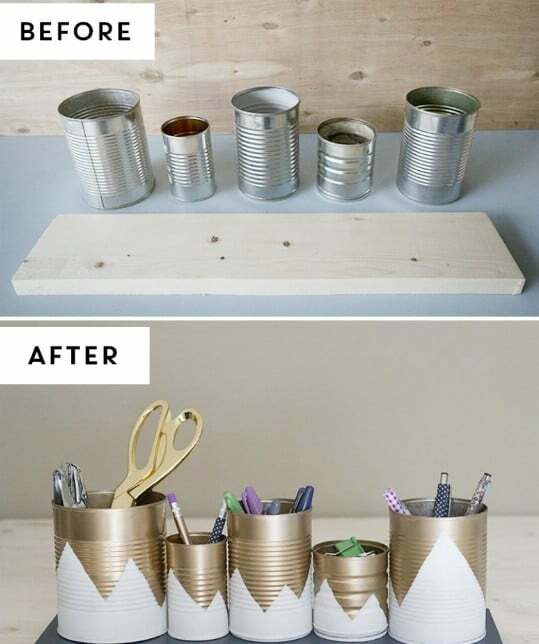 Those empty food or even paint cans can be turned into gorgeous desk décor and organizers and it won’t take you long at all to make these. You could use smaller cans for paper clips and rubber bands and larger cans for pencils and pens and any number of other desk necessities. You assemble them all together on a reclaimed board so it’s actually one piece with multiple organizers. 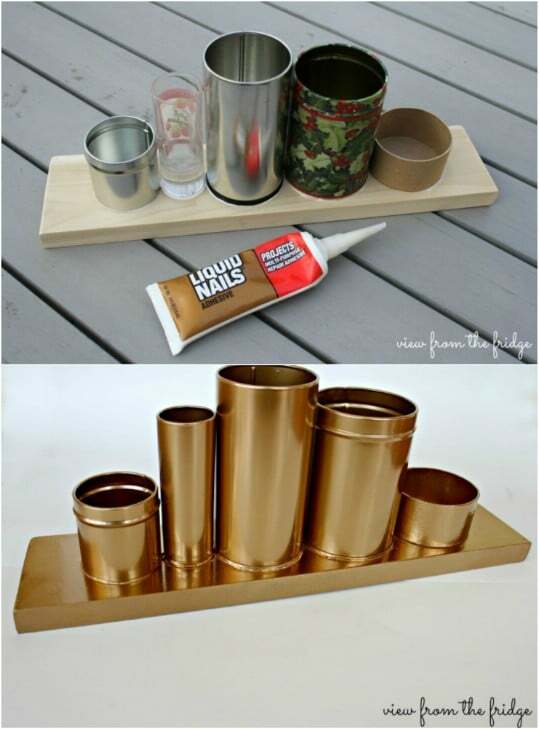 What a wonderful way to upcycle empty tin cans! 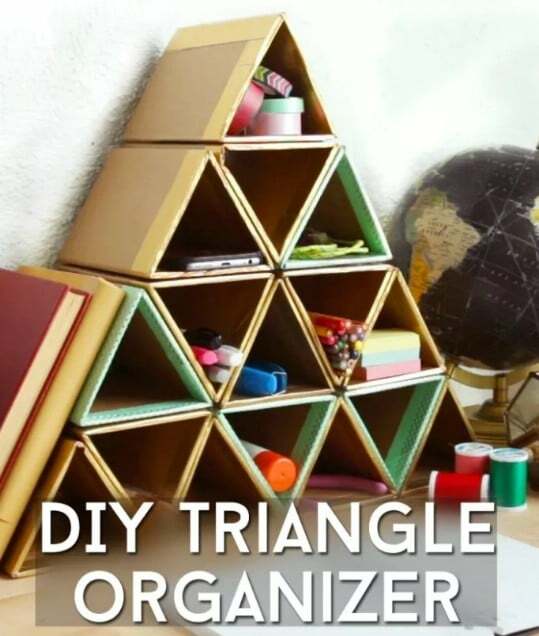 You can attach this DIY triangle organizer to the wall or just lay it on your desk. It holds so many things! And, it’s super easy to make. And even better? It is completely made with recycled cardboard so you are getting a great desk organizer to help you to declutter and you are doing your part to help the environment, as well. 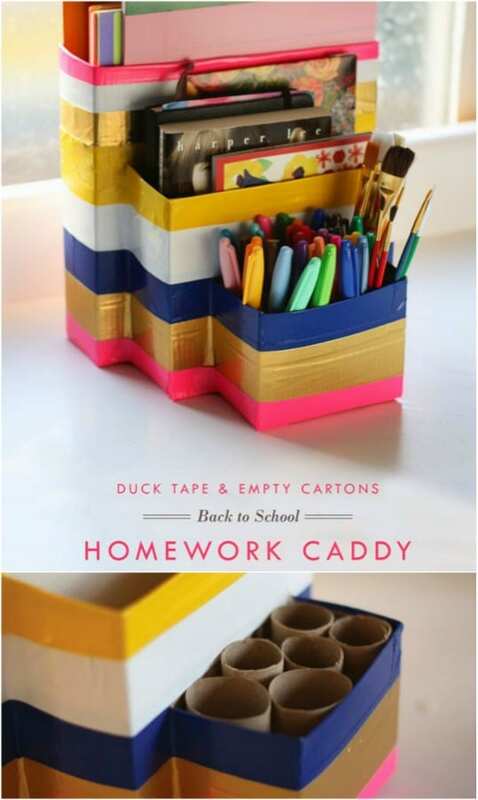 This is a great organizer for teens’ desks, too – it has such a great geometric look and shape. 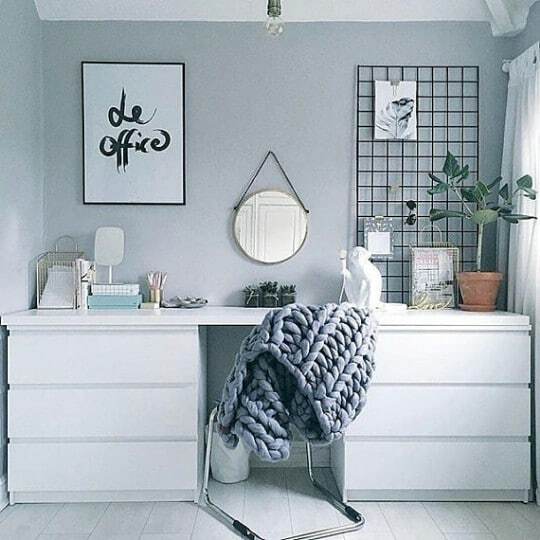 A wire wall grid is the perfect way to declutter and organize your desk. You just attach the grid to the wall behind your desk and then use clips, clothespins or any number of other things to keep your desk necessities organized. I found this great wall grid on Etsy for under $20, but you could easily recreate this look with some old chicken wire or even a small bedspring from a baby crib.